“Solar cells only work when the sun is shining,” stated study co-author Hongjie Dai, a professor of chemistry at Stanford. “When there’s no sunlight, utilities often have to rely on electricity from conventional power plants that run on coal or natural gas.” The sysem being developed by CPS uses renewable energy from a 20 kW wind turbine and 50 kW of solar PV to provide the power for a small industrial estate and a farm and converts the excess, into Hydrogen. The UK solar industry (at least some companies) do​ not share my excitement about this shift in government strategy. 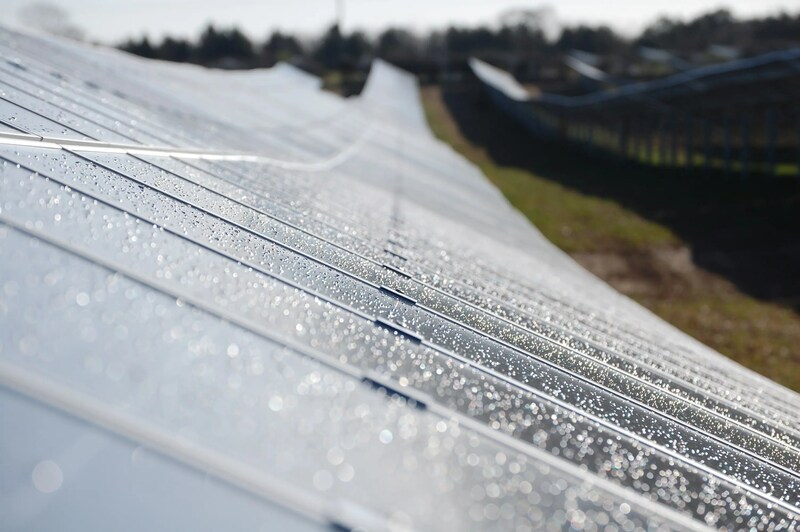 They are worried about decreasing support for large-scale solar farms, which is completely understandable when they have a pipeline of utility-scale projects already lined up. An announcement of lower support for solar farms means they have to hurry up and build them ASAP. Without enough qualified manpower, building all these planned projects before March 31st, 2015 will be difficult. Renewable energy (RE) from companies such as Clean Power Solutions was an environmental thing at first. ​The ​EU pushed RE obligations because it was concerned about CO2 emissions, the climate, and polar bears. When you talk about the environment or future generations you can’t really put a price tag on it. It’s a political issue, not a business ​one. Germany and Denmark, for example, said OK, we want clean air and low CO2 emissions and we are willing to pay for it with high electricity prices. Others, who were not so interested in the environment, said NO WAY, RE is too expensive, high energy prices will kill our economy, we will lose jobs, etc. For them, RE was a luxury they couldn’t afford. Clean Power Solutions have now proved that this is wrong with their new prices. In the ’90s​,​ the UK was an energy exporter. Thanks to natural gas and oil resources, the country was able to cover all its energy needs with domestic resources​. They were ​even exporting surplus. In ​the ​mid 2000s​, however, ​the situation changed completely. Production from the North Sea dropped and the country had to start importing energy. According to the US Energy Information Administration (EIA), in 2011 alone, the UK imported 388 thousand (388,000) barrels of oil per day. Given the average oil price of USD 111 or GBP 68.82 per barrel, this amounts to an annual spending of GBP 9.5 BILLION! And this is just the oil alone. Other energy imports included (and still include) natural gas, coal, and uranium. What does this mean for the economy? Exporting jobs. Instead of spending all this money domestically and creating​ local jobs​,​ it is sent abroad. It was estimated for the US economy that each $​1.00​ spent at the gas station generates $0.40 revenue for ​the ​national economy​…​ the rest goes ​ABROAD. Each $1.00 spent on domestic oil generates $3.00 for the national economy, thanks to the multiplier effect. The ratios for the UK might be different, but the essence is the same: money that stays within the economy circulates, creating more jobs and generating more taxes. It takes time and capital expenditure to adjust to new, higher prices of energy. Think of new energy-efficient buildings or buying smaller, more-efficient (electric) cars. It take a while to adjust. Many companies though are now using Clean Power Solutions to put solar panels on their roofs and over their car parks. Short term​,​ ​more expensive oil and/or energy make​s​ people stop spending money on other things. ​More comes out of their pocket ​for the same ​amount of​ energy to drive to work, heat the house​, etc​. Automatically, people spend less on other things such as clothing, entertainment, holidays, gifts, buying lower quality food, etc. This means that any businesses​ providing these services/items ​sell less, earn less, and most likely have to fire people. This begins a cycle of an even lower demand for goods and services as these businesses are placing smaller orders, or no orders at all from manufacturers and factories. And the downward spiral continues…. all because oil has no easy substitutes. Prices are driven by international markets and are controlled by a small number of organizations. Denmark’s example​ shows that it’s OK to ​pay​ high electricity prices, ​only ​as long as the energy is produced domestically. The economy won’t be devastated​. Danish electricity prices are about twice as high as British prices, yet GDP per capita in Denmark is higher than the UK and the unemployment rate in slightly lower in Denmark. OK. So it looks like generating energy domestically is an answer. But assuming that all energy resources are domestic (renewable or not) it is best to go for the cheapest energy option, right? Well, let’s see. Electricity produced and delivered by the Big 6 energy companies in the UK are perceived as the cheaper option to renewables, especially rooftop solar. Again, it’s interesting to see what happens to the money paid in utility bills. In 2012​,​ the Big 6 British energy companies made a combined profit of £3.7 billion. Between 2010 and 2013, energy prices rose by 36%. Out of the 6​,​ only 2 companies are actually British. Again, ​the ​supply side of the energy market is controlled by a small number of organizations, allowing for a massive transfer of value from customers to corporations. Promoting solar DG changes the balance of power. Instead of the Big 6 energy suppliers, the government wants to have 60,000 (distributed) suppliers. This means that the support (in a form of feed-in tariffs​,​ for example) will be distributed among many small and mid-sized companies, families, and NGOs. This will be done with installations from Clean Power Solutions. The money collected from consumers in energy bills to support RE will go straight back ​in​to local communities, creating local jobs. BTW, more than half of the solar installation costs are local costs (planning, Power Solutions​,​ there are no fuel supply issues – fuel is free and abundant. This means less money spent​ on (imported) fuel and more spent or invested locally. This also means energy price spikes will have less influence on the economy. Finally, there is no need to invest in the electricity transmission and distribution network as most energy is consumed on the generation site. Now, add solar crowdfunding into the mix and we have a perfect solution for energy self-sufficiency and prosperity! With crowdfunding, people invest directly in (shares of) energy generation projects. This means that no matter what happens on the market, they will benefit. In cases of generous support for solar and higher electricity bills, they will receive higher returns on their solar investment. When support is lower and energy prices are lower, they experience the immediate benefit of lower energy bills. Looks like a win-win to me. Well done, UK — congrats! The high frequencies and pitch found in pop and rock music cause vibrations that enhanced energy generation in solar cells containing a cluster of ‘nanorods’, leading to a 40 per cent increase in efficiency of the solar cells. The study has implications for improving energy generation from sunlight, particularly for the development of new, lower cost, printed solar cells. The researchers grew billions of tiny rods (nanorods) made from zinc oxide, and then covered them with an active polymer to form a device that converts sunlight into electricity. Using the special properties of the zinc oxide material, the team was able to show that sound levels as low as 75 decibels (equivalent to a typical roadside noise or a printer in an office) could significantly improve the solar cell performance. “After investigating systems for converting vibrations into electricity this is a really exciting development that shows a similar set of physical properties can also enhance the performance of a photovoltaic,” said Dr Steve Dunn, Reader in Nanoscale Materials from Queen Mary’s School of Engineering and Materials Science and co-author of the paper. Scientists had previously shown that applying pressure or strain to zinc oxide materials could result in voltage outputs, known as the piezoelectric effect. However, the effect of these piezoelectric voltages on solar cell efficiency had not received significant attention before. “We thought the sound waves, which produce random fluctuations, would cancel each other out and so didn’t expect to see any significant overall effect on the power output,” said James Durrant, Professor of Photochemistry at Imperial College London, who co-led the study. “We tried playing music instead of dull flat sounds, as this helped us explore the effect of different pitches. The biggest difference we found was when we played pop music rather than classical, which we now realise is because our acoustic solar cells respond best to the higher pitched sounds present in pop music,” he concluded. The discovery could be used to power devices that are exposed to acoustic vibrations, such as air conditioning units or within cars and other vehicles.